Tuesday evening’s international friendly between England and Spain wasn’t the average England friendly. It was interesting, at times entertaining, and we could actually learn something from the game. Gareth Southgate set his side up with a tactical plan that was working to perfection for 80 minutes. We got back into defensive shape when Spain had the spells of possession that you’d expect from them despite it not being their strongest XI. And on set triggers, the team pressed. When one player went to press an opponent, he was backed up with everyone behind him squeezing up and the front 4 looking to win it high up the pitch. We broke forward very well with the pace of Sterling, Vardy and Lingard complimenting the skill of Lallana. Liverpool’s Adam Lallana is fast becoming England’s best player. He added to a string of recent good performances for his country with an influential first half until injury forced his withdrawal. England missed his skill, vision and creativity in the second half as his influence on this England team grows. Southgate clearly wants his England team to play out from the back. At times Scotland forced errors when we tried to play out so Spain and their high press was a good test for a way of playing that is alien to England defenders of years gone by. 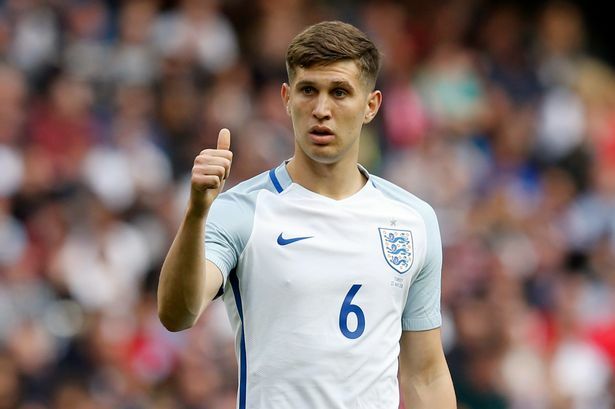 I actually commend the new England for this and love to see John Stones calm under pressure. The problem is, there aren’t many others in the defensive third of the pitch on Stones’ level in possession. Cahill always looks panicked on the ball, Henderson is quite one dimensional and as much as I rate Dier, he’s no Busquets. When Jagielka came on he made no effort to make angles to receive the ball and was hoping for someone to launch it long. Jagielka is not an international class defender anyway though so that’s not likely to be an issue going forward. The midfield need to work harder and have to want to get on the ball more than they do. A lot of the time Stones has the ball and looks for a pass into midfield. Dier would come short but he’s followed by a Spanish forward. He should then be looking to rotate out of that space for someone like Henderson to move into and receive the ball on the half-turn. And only Stones really sprints into a position to receive after the ball’s gone back to the goalkeeper. Several times in the game saw Cahill and Stones make a long pass back to the goalkeeper because they’re incapable of opening up and playing a simple pass with their left foot. I think we can learn to play out from the back, but we need some better technical players in the right areas. This game, along with the friendly away to Germany earlier in the year, gives at least a hint that this England side could be capable of doing OK against good opposition in major tournaments. The worry now is whether we can reach the stage in tournaments where we’ll get to play the traditionally bigger nations. Because recently it’s the smaller countries (Iceland) or the teams who just “park the bus” (Slovakia, Slovenia, Russia) who we struggle against. This is because even poor teams can now be well-organised and we have just ran out of ideas against these types of teams. What this England performance showed is the effectiveness of pace and energy in the final third. Could England have pressed quickly with Rooney in the side? Possibly not. Could England have counter attacked so quickly and effectively with Rooney in the side. Definitely not. I maintain the view that there isn’t a place for Rooney in the current England side. He is not a midfielder. If he is to play it must be as a #9 or a #10. I’d say as the #9 really, because he doesn’t have the dynamism or spark to play as a #10 anymore. But with him as the focal point of the attack we wouldn’t break forward at pace like we did at times against Spain. All in all, England actually looked and played like they had a tactical plan. Credit to Southgate for that. If we want to play out from the back we need better technical players in defence and midfield. Maybe the promising England youth sides will provide these players. And while Rooney is looking more like a bit-part player, Adam Lallana is emerging as the key talent.